of engineering for the fit. Traditionally turned boxes were made in boxwood (Buxus sempervirens) a very dense, fine straight grained, hard and stable wood - exactly the properties to look for. 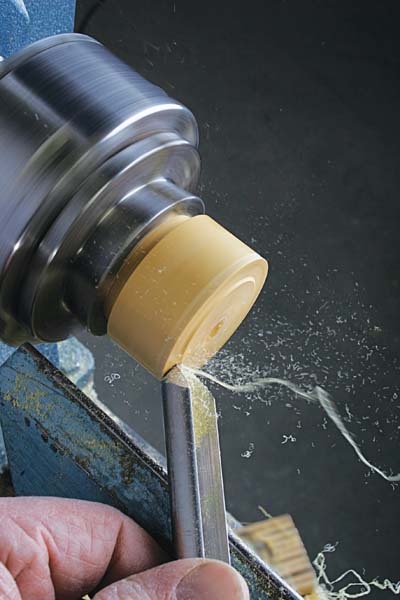 It takes fine turned detail with an excellent finish. Boxwood is probably the perfect wood for making boxes, but this timber does have one disadvantage: it is rather a bland wood, though it takes decoration well. There are more exciting woods with similar qualities that will make very nice boxes: ebony (Diospyros spp) Indian rosewood (Dalbergia latifolia), lignum vitae (Guaicum officinale), all of which are exotic and expensive. Nearer to home, fruit woods and holly (Ilex spp) can be good providing they are very dry, otherwise they can be unstable. Simplicity of shape should be the starting point. 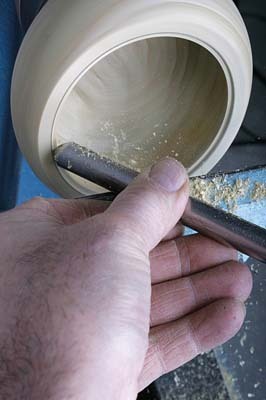 Make the outside straight sided, or very slightly barrel shaped. 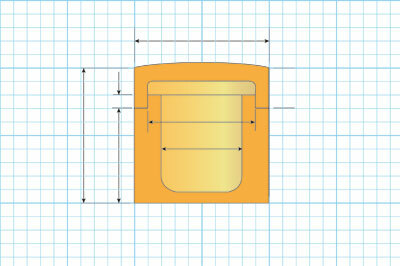 The top should be slightly domed; the bottom - turned and slightly concave - then turn the inside with straight sides and rounded corners, as it is easier to blend the base and the side. A pillbox size - which can be carried in the pocket - with a push fit lid, fits easily in the hand, and can be opened with a slight twist. I think it is important for this kind of piece that the grain flows through the box to look as if it is one piece. Don't forget that you want surfaces that you can easily grip to take the lid. Making the height and diameter the same gives a nice proportion. 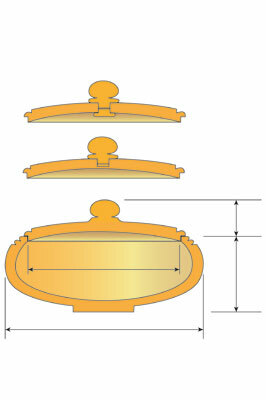 Size: about 45mm (1 3/4in) - 50mm (2in) split; base, two-thirds and the top should be one-third. Though no matter how well the box is turned, and the grain matches, the joint line will almost certainly be visible, but, in my opinion, this is an acceptable feature. 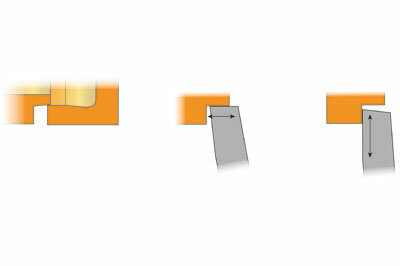 If you want to disguise the joint, then try turning some feature on the joint and repeating it either side of the joint. A little decoration can help to enhance the shape. For a box with a friction fit lid, the wood needs to be very stable, i.e. 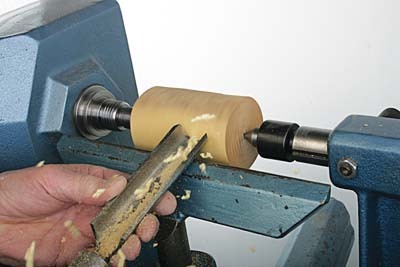 it will not change shape after turning; this is partly taken care of in the timber selection. The timber needs to be kiln dried. Care should then be taken in where the blank is cut from the tree. I had a choice of timber: a branch of boxwood with the pith in the middle, which had been in my workshop for some 20 years, or apple remnants from the big order. 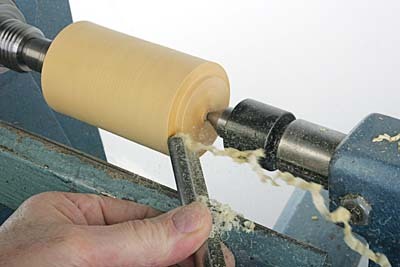 This project requires a spindle roughing gouge, shallow fluted gouge (or deep fluted gouge), parting tool and scrapers. 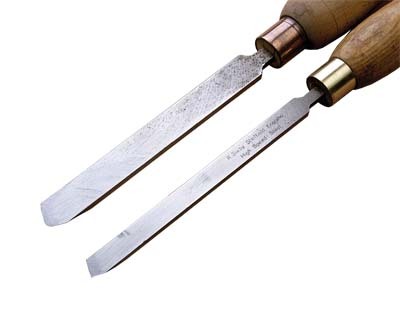 Gouges are general tools, but scrapers are 'specific' and for this box we require two specific scrapers: A 'left-hand straight' cut scraper for making the joint face and the reference face, and a similar one but with the corner rounded for refining the inside and the corners. It is worth shaping scrapers for this box, as they will be very useful on other projects. 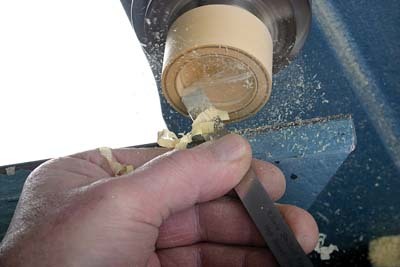 You will also need a large 'left-hand straight' scraper. 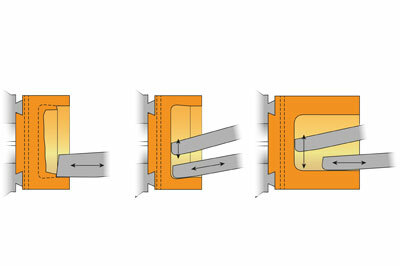 Turning a box is almost 'engineering' in wood due to the precision and the systematic procedure required. The boxwood (Buxus sempervirens) finished so well off the scraper that I could have left it un-sanded, if I had chosen to do so. 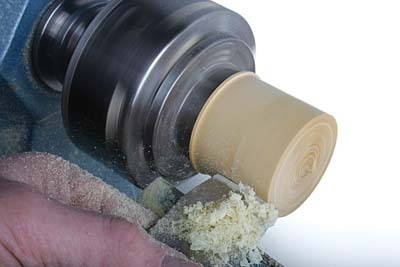 However, If you do sand, don't start with anything less than 240 grit and be sure to finish with 400 grit. An oil finish, applied at a very slow speed then buffed at turning speed, gives a very nice feel to the box. Whilst making the boxes for this project, I had a stop clock on the end of the lathe and I timed each one I made, which usually takes me anywhere between 35-40 minutes. But this time, I desperately wanted to break the 30-minute barrier. The fastest one I made - and one of the best, I might add - was the one I started just as a family came into my workshop. I chatted to them as I turned - obviously I was in fully automatic turning mode - and when I stopped the clock, it was just on 32 minutes. 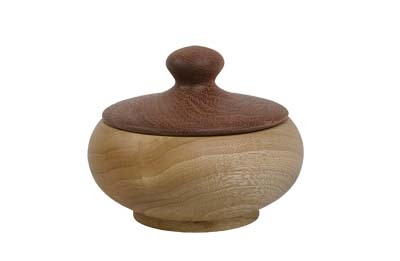 An alternative type of box might be better described as a 'lidded vessel' such as a small bowl with a lid. 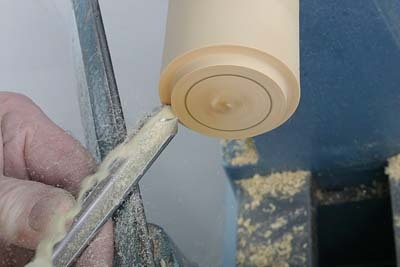 These are generally larger and cross grain - the size would preclude a tight-fit lid as it would be difficult to remove. Also, any distortion of a 'cross grain' vessel would compromise the fit. 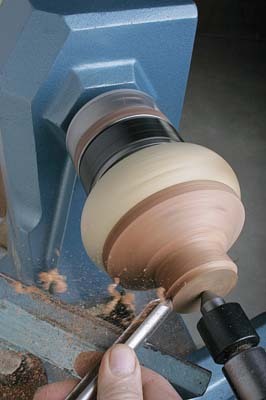 This is a small footed bowl with an in-turned rim into which the lid fits. It's a good idea to design the rim so that the bowl can stand alone without a lid. The lid should have a handle for lifting independently. There is room for a matching or contrasting lid and base. If the lid and base are from the same wood, then it is desirable for the grains to match as much a possible. 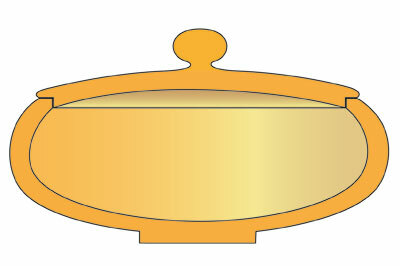 The lid is hollowed to match the bowl design and gives it the correct feel and weight. 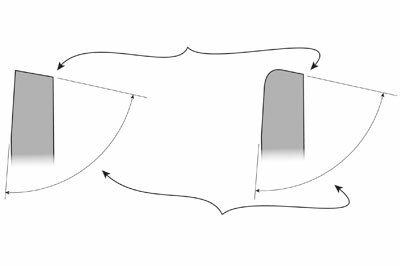 There are a number of options for the knob. Whichever method you select, this will affect the chucking method. 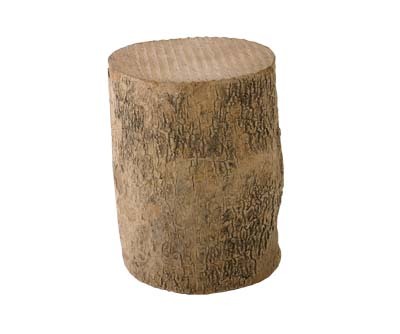 I recommend a kiln dried, medium to close grained, hardwood. If the grains are going to match then the bowl and lid should be made side by side in the same plank. If you are going for contrasting woods then make one part, probably the base with a strong grained wood, and the lid from a delicate grained wood. When it comes to making boxes and lidded vessels, being methodical and following a planned sequence makes the project possible. 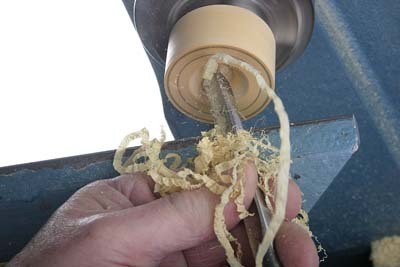 Setting out just the right shaped scrapers allows the sequence to flow easily, and, while the projects could be made with just a faceplate, some glue and a waste block, having a variety of chucking methods to hand makes it quicker and easier. This was the first time I've turned boxwood, and I must admit that it was a real delight to work with. Michael moved to the north of Scotland with his work as a research & development engineer, but left in 1974 to become a lighthouse keeper at Dunnet Head. 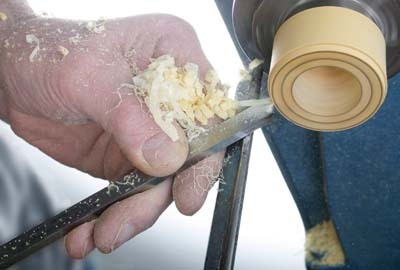 He took up woodturning to try and make some extra money and has been at it ever since.